Nostalgia Gassers Racing Association | "Drag Racing – The Way It Was in the '60's"
The Nostalgia Gassers Racing Association was formed in 2011 by a group of gearheads with a love for the old mid 60’s style gassers. Many of the groups’ gassers were actually raced in the 60’s. Then when the class died in the early 70’s, the cars were either stored, used for a show cars or converted to street rods. Now they have been brought back to their racing glory. Others built 60’s style gassers so they could race with the group. 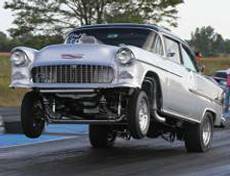 The Nostalgia Gassers Racing Association’s main focus is having FUN while drag racing their old gassers. The Nostalgia Gassers Racing Association is a family oriented group and is approachable in the pits. They love to talk old style drag racing with any and all. So stop on by, pull up a seat and let’s chat for a spell.